With gesture-controlled technology now being the buzzword with respect to solving a host of problems related to everyday activities, there now actually exists a wearable which tracks hand gestures and let you perform a host of activities on any environment. This wearable called Kai (Sanskrit word for hand) sits on your hand and tracks gestures. Potential issues solved (through gestures) include volume control, slide changes during presentation, and contactless drawing for creative professionals apart from performing a host of other multimedia activities. 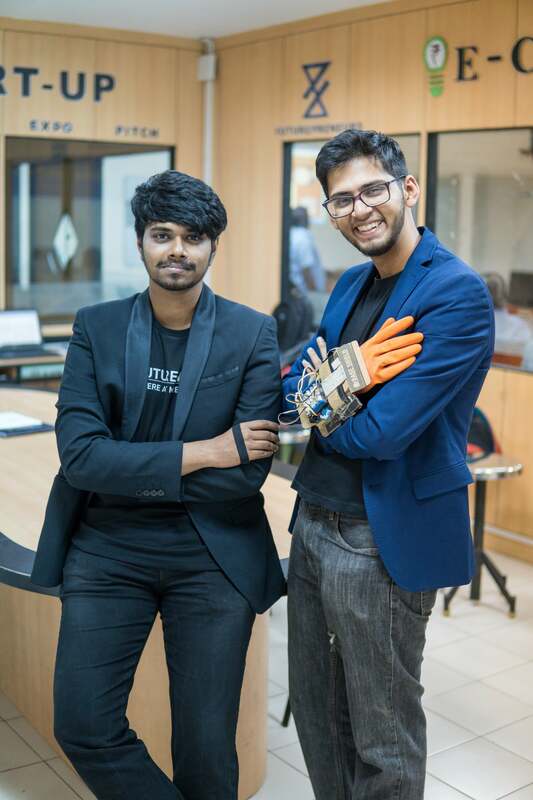 Kai has been developed by Vicara Technologies, now based out in Bengaluru, founded by Abhishek Satish and Adarsh Warrier; both 22- year old recent engineering graduates. Vicara is funded by SCINcurator which is the funding arm of Startups Club in Bengaluru. In a candid interaction with Adarsh Warrier, Entrepreneur India analyzed whether Kai would qualify as yet another startup product, or bridge the innovation gap. A major USP of Kai is its ability of contactless finger recognition, and recognition of gestures without cameras. “In conventional gesture-recognition devices, the hand should be in the range of the camera; with lighting also playing a major part in the proper recognition of gestures,” states Warrier to Entrepreneur India. These issues are mitigated through Kai; as it could just be worn over the hand in any environment, and paired to a computer through Bluetooth. Kai works by tracking all the fingers, and hands. This potentially presents the users a realistic way of interacting with the environment and systems. “Our niche, for Kai, is creative professionals (to be used as workflow automation tools). Anybody using the PC for creative stuff would find the gesture-recognition device most useful,” adds Warrier. At this stage, Entrepreneur India tried out a prototype of the device and found the unit to be relatively light meaning graphic designers would be able to indulge in operations such as rotation of models (virtual), zoom in/zoom out, and 3D model interaction with effortless ease. Another segment are the music producers who could contactlessly indulge in things like volume control. “We also have an aim of branching out into AR and VR, once Kai takes off commercially,” informs Adarsh. The current design of Kai (See below) has witnessed as many as 22 iterations; right from the time when it was conceptualized as a hand glove consisting of wires inside; intended to be an Internet-of-Things (IoT) device to control objects around the users (lights and PC) wirelessly. “We went all guns blazing, just started out; and then branched out gradually and turned Kai to its current designs, the innovation process was a lengthy one,” recalls Warrier. After having been incubated at the Vellore institute of Technology (VIT), Vicara has now plans to kickstart an Indiegogo campaign slated to go live from May 21. The aim is $100,000. The campaign would be a 40-day one. “We recognized that there is a market pull for Kai. Indiegogo is an ideal platform for ensuring reachability, and generate money upfront” he believes. As far as its pricing goes, Warrier informs that Kai would be sold for USD 249; with shipping cross the globe. Early-bird offers include a flat 50% discount, and the unit retailing at USD 125. Vicara’s investors and investment include mentorship by VIT, and Startups Club; with undisclosed equity funding raised in addition to a seed of INR 20 Lakh. Future enhancements for Vicara would include Kai-like innovations for workflow automation in healthcare, and projects around human augmentation.